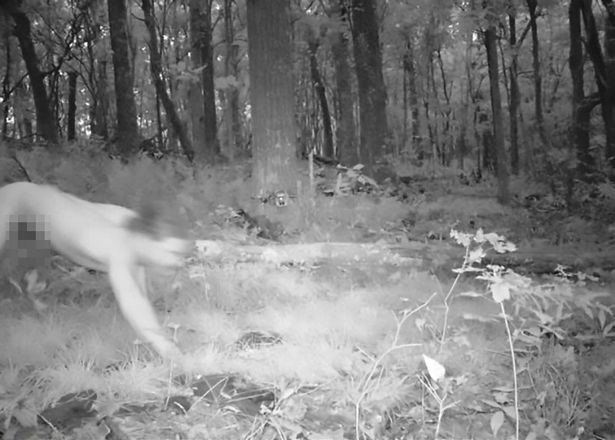 Wildlife cameras set up in a forest phototrap to capture nocturnal animals unexpectedly snapped a naked man high on LSD - who thought he was a Siberian tiger . A Czech man - who has since been identified only as Marek H. - was apparently trying to treat his depression by taking the drug , according to local reports in Poland. After taking the hallucinogenic substance he swiftly darted in the forest, stripped naked and discovered his "true personality" - that of a tiger whose native habitat is a mountain in far east Russia. He got so into the 'persona' he even picked up a scent and travelled miles in pursuit of his prey. But his antics were captured by the hidden cameras - which had been expected to pick up a different kind of 'wildlife'.Bemused foresters handed the photographs straight over to police. They later on apprehended Marek - who turned out to be a 21-year-old man from the northern Czech Republic town of Liberec. Marek confessed to police that he had taken the hallucinatory drug LSD.He said it started to work immediately and that he felt he had become a Siberian tiger. Moreover, Marek told them that this was when his "true personality woke up". He told policemen that, once he had become a tiger, he had "picked up a scent" and felt compelled to follow it.